A crack team from The Irishman took over the tasting room at last month's whiskey society meeting. They dimmed the lighting, sparked up candles, spread barley artistically over the side tables and displayed the bottles of whiskey on oak plinths crafted by one of their own number. You can see that same obsession with presentation when you pick up one of the heavy French-made glass bottles that hold The Irishman and Writers Tears whiskeys (the French make the best bottles, I learned recently). Packaging is important when you are a small, independent Irish company with a tiny marketing budget compared to Jameson or Tullamore Dew, say. There is substance behind the style. The founder of the company, Bernard Walsh, is a staunch champion of Irish pot still spirit and hand picks the casks that go into his whiskeys. I have to digress for a moment with some terminology. In Ireland, pot still whiskey normally refers to whiskey made in a copper pot still from a mash of malted and unmalted barley. Malt whiskey is also made in a pot still but from malted barley only. A blended whiskey combines one or more of the above with grain whiskey, which is made more cheaply from corn (maize) in a column still. What Bernard and his team do that is unique is to make blends by combining pot still and malt whiskeys. Unlike normal blends, they contain no grain whiskey. No other company - Irish or not - produces whiskey like this. The Irishman whiskeys are available in 34 countries while the newer Writers Tears brand has reached 14. The top five markets are France, the USA, Japan, Germany and the UK. Growth in 2011 was 31%. Marks and Spencer are about to stock The Irishman as the replacement for their Cooley-made private label, supplies of which were cut off by Beam. The Irishman doesn't make its own whiskey (I wouldn't bet against this in the future though). Because of contractual arrangements they don't disclose where the whiskey comes from, only that it's Irish. I'll just say that if you parse the label information carefully (don't neglect the detail about water sources) and combine that with your knowledge of the various distilleries you can make some educated guesses yourself. Known as The Irishman Original Clan in the United States, this is the one that kicked off their signature pot still / malt blended style. It contains 70% malt whiskey and 30% pot still whiskey. It's all bourbon matured, which is another hallmark of the company. It has no age statement but the whiskey is at least 8 years old. Like all of the evening's whiskeys it's triple-distilled. The water is from Cork; so says the label. The nose is very nice - spicy with just a hint of smoke (which is not to suggest that the whiskey is peated; it isn't). The taste doesn't quite match this promise. There is the vanilla you would expect from the American wood but no sweetness. The finish is a kind of fresh peanut dryness rather than a woody dryness. It's certainly smooth and very drinkable but it was my least favourite whiskey of the night. This whiskey again has no age statement but it's matured for at least 10 years. Shane told us the malt spends 8 years in bourbon barrels, followed by 2 years in sherry casks. This time the label mentions the "waters of St Columb's Rill". It's made in batches of 1,000 cases. We still have the vanilla from the bourbon casks but also floral notes and a sweeter finish, no doubt due to the sherry. It would be interesting to compare The Irishman single malts side-by-side with Knappogue Castle single malts. Knappogue is an independent bottler too, with both bourbon-only and sherry-finished malts. From here to the end of the tasting we were on pretty solid ground. I rated this and all the subsequent whiskeys roughly the same, though I did have a favourite. There have been several bottlings of this, always as a limited edition. This was from the 2011 run of 2,400 bottles. Twelve bourbon casks went into it: 5 pot still and 7 single malt (I make that about 58% malt). Shane told us that the age profile of these casks stretched as high as 21 years. It has that dry but unwoody finish again, and some vanilla. It's a characterful whiskey for a serious mood. I'm going to call this one a "work" whiskey, rather than a "relaxation" whiskey. I'm drinking some now, as I work on this post. This was the second most popular whiskey on the night in a room vote. Now we come to my favourite. It's one I always recommend to people looking for a good Irish whiskey. At €38 it's amazing value too. I'm glad to say it edged out all the expensive whiskeys in the line-up for me. It's a 60/40 malt/pot still mix, about 10 years old. It's still all-bourbon but that extra portion of pot still elevates it above The Irishman 70. It's 40% ABV but non-chill filtered which is very unusual. Writers Tears intentionally doesn't share a distributor with The Irishman in any of the 14 countries it's sold in. It has it's own, more contemporary, personality. I am used to the lack of an apostrophe now, by the way. Not so The New York Times whose editors couldn't let the name pass without "fixing" it. If they were on a grammar crusade they should have raised an eyebrow at "Powers" too! I'm still sipping the cask strength but I might pour one later and add a note or two. There were 1,200 bottles of this and the company has shipped all of them. The good news is that there is a 2012 edition in the works. 1,800 bottles of this are due at the start of September or so. Apparently they can't keep Writers Tears bottles on the shelves in Germany. Not entirely the steadfast savers they are reputed to be, then. Thank you for the economic stimulus, meine Freunde! I was enjoying this one too much to write any notes on it, apparently. I rated it just the merest sliver below its 40% sibling. Whiskey number 6 came in an unlabelled bottle, filled directly from the cask. It's a 12 year old triple-distilled single malt, all bourbon cask, to be released at the end of the summer in a very limited edition. It will be the first time that a bottling from The Irishman carries an age statement. I don't know what strength it will be released at. It took a little watering well but faded a lot with a little more. Nobody outside the company had tasted this before. It was the room's favourite. Not mine, though I did like it. It's a personal thing. I've never entirely warmed to single malts from, um, whatever distillery these malts come from. Some people love them though. To sum up, you can't go far wrong with The Irishman or Writers Tears whiskeys. They look good, they taste good. They are a safe gift for someone who knows their whiskey and there is a good chance they won't have tried them before. 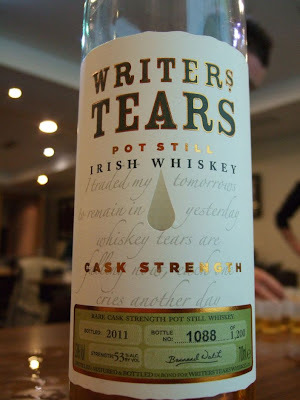 My personal recommendation would be to go for Writers Tears first, then Cask Strength anything.